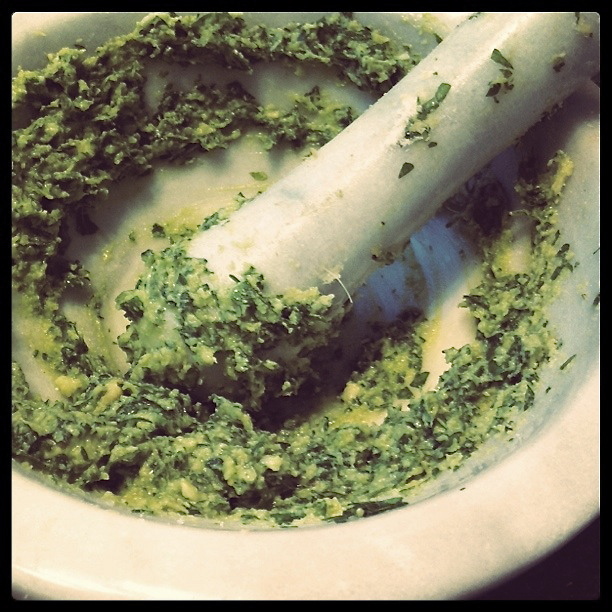 Everyone has their own opinion about what makes the perfect pesto. Recipes are a dime a dozen. I won’t pretend to be the world authority on it (I’m sure there is a lovely Italian Nonna somewhere who holds that title) but mine is pretty darn good. At least in my kitchen, pesto often doesn’t even refer to something made with basil. 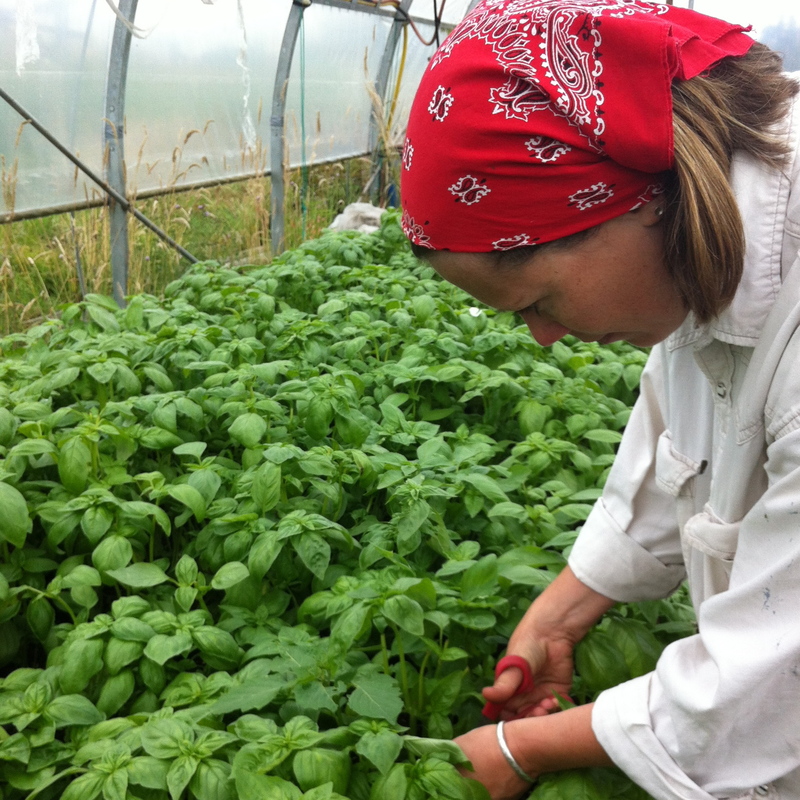 I’ve made variations with arugula, nettles, peas, asparagus and even kale. I’ve added and subtracted different nuts, cheeses, oils and spices. The recipe below, if you can even call it a recipe, is my base. I make vats of it to freeze. Keeping lots on hand means that throughout the year I am able to add it as flavouring for eggs, in soups, on a pizza, chicken and of course with pasta. It is as simple as well, pesto. The old fashioned way. Mortar and “pesto”. The purists amongst you will notice I don’t add any sort of nuts or garlic. I have just found that too many people I know can’t eat nuts and that garlic when frozen tends to go bitter. Both ingredients though are easy to add in later. Here’s my way of preserving the taste of summer. Of course, you can eat it right away too. * Ingredient amounts listed make approximately one ice cube tray (and a bit for tasting) worth of pesto. 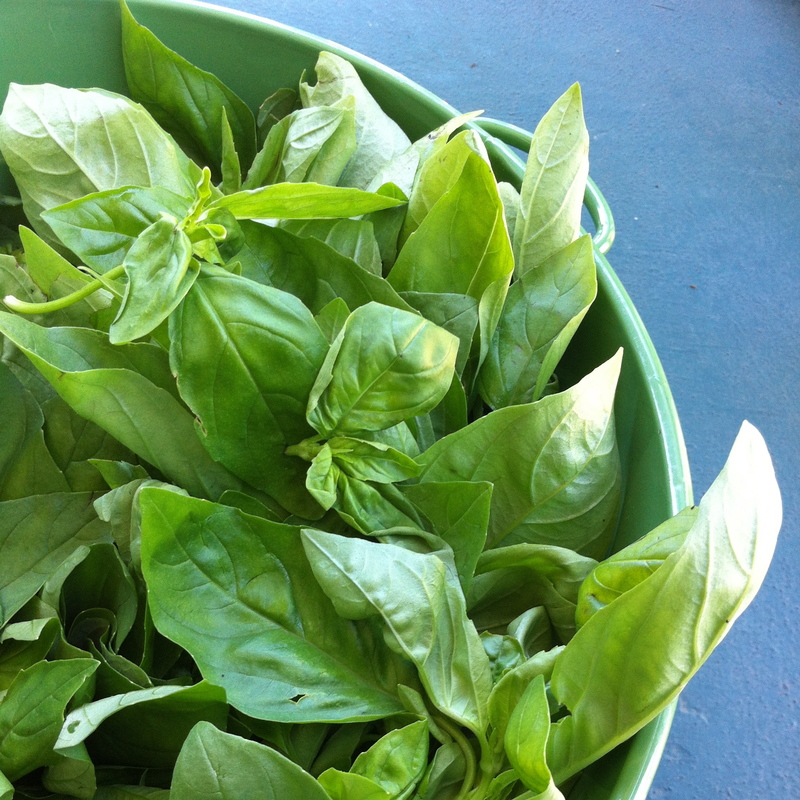 Simply take your fresh basil, wash it and pat it dry. 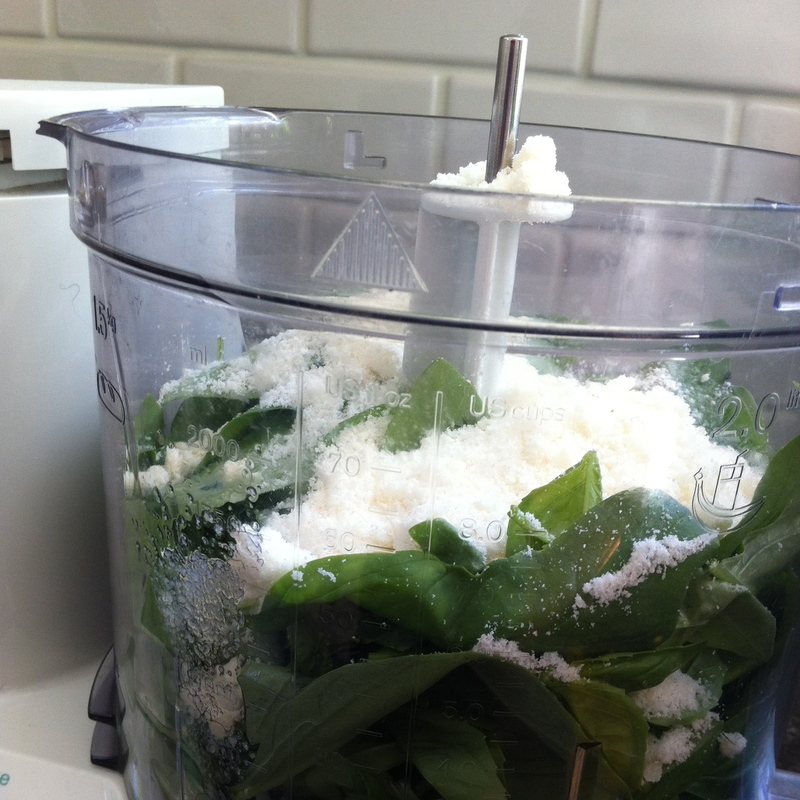 Place basil, cheese and half the olive oil in a food processor. Blend gently and if needed slowly drizzle in the remaining olive oil. 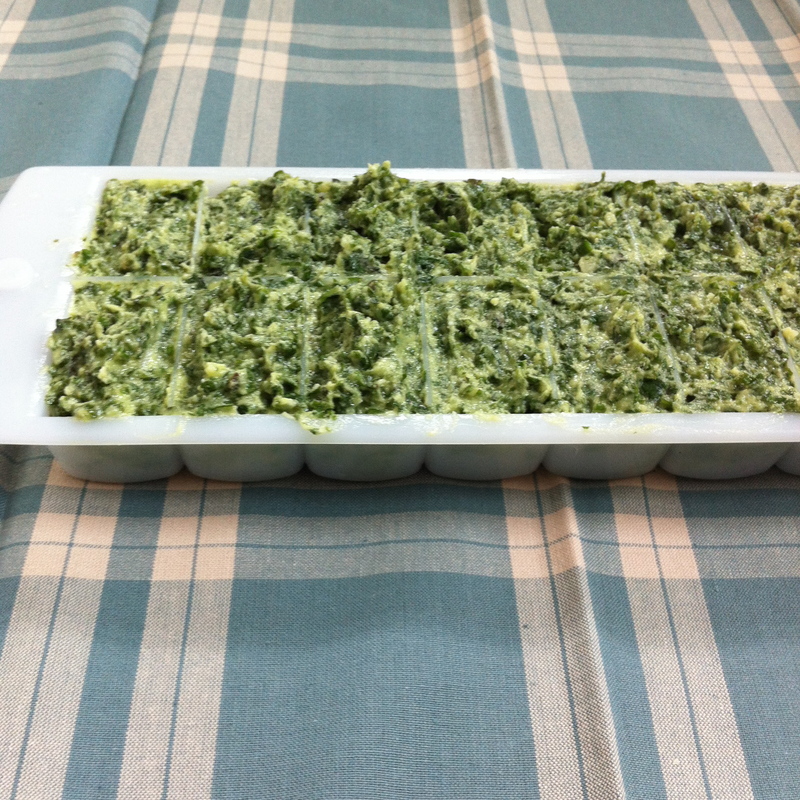 Spread the pesto in an ice cube tray, securely cover with plastic wrap and place in the freezer. When frozen, remove cubes from trays and place in a labelled freezer tight container. This entry was posted in Cooking, Cooking techinques, Food, Herbs, Recipe, Summer and tagged basil, cheese, farm, olive oil, parmesan, Romano by mostlynoodles. Bookmark the permalink.